I hesitated before posting this, as I don't approve of disseminating potentially harmful information. But then - anybody can find it in 5 minutes Googling & burglars already know it. Innocent householders like me though, maybe don't. We recently returned from a week's absence to find we couldn't unlock the usual door to get into the house. Fortunately, AA had stayed home & had found the problem when inside trying to get out, rather than outside trying to get in, and had been able to use a second entrance, which is normally double-locked & chained. So we had a problem, but not an emergency. Had we been stuck outside, we would probably have called out a locksmith, which is notoriously expensive & (as I now know) pointless. 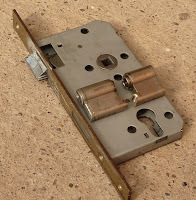 I knew nothing about French (or any other) door-locks, but a bit of Googling soon made things obvious. 1. The big rectangular latch mechanism, which can only be removed from the door when the door is open & after the barrel is removed. So nice guys can't remove the lock without unlocking it. I had not previously realized that there are actually 2 separate lock barrels; one for the key from inside & one for the key from outside. 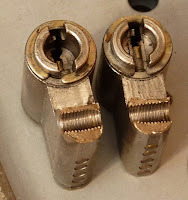 They are joined together by a very small section of metal, the rest of the keyhole section being cut away between the 2 barrels to allow rotation of the lug which operates the latch. That very small section of metal is then drastically weakened by being drilled & tapped for the screw which holds the barrel into the latch mechanism. So you don't need to be much of an engineer (or much of a burglar) to see where to attack this lock. I used an adjustable spanner, clamped it snuggly on the rectangular section of the protruding barrel, and pushed sideways. The barrel instantly broke at the ridiculously fragile center portion & the 2 halves fell out of the door. 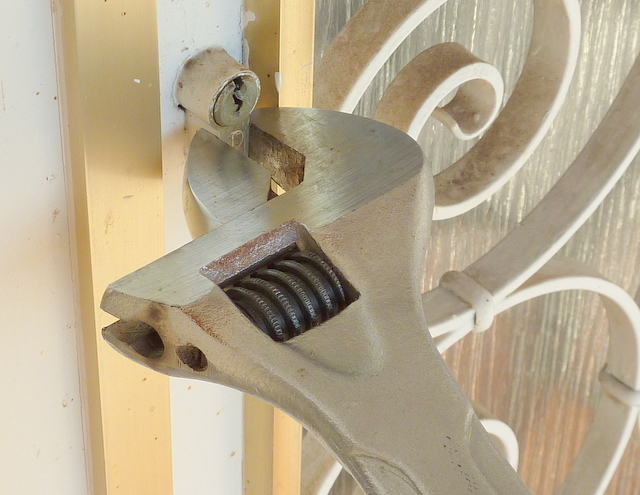 A screwdriver was enough to slide the latch open & we were home. Sobering to realize that any burglar with 5 minutes theory/practice could break in silently in less than 30 seconds! I don't think our lock was unusually fragile either. They all seem to have much the same weak link. These locks will only keep out people who don't really want to get in, or have only bare hands available. I have to think seriously about getting something quite different.